On 17 Apr 43, RAAF light transport aircraft DH84 DeHavilland Dragon serial A34-47 went missing during a flight from Mascot Aerodrome Sydney to Forest Hill, NSW. To date, no wreckage of the aircraft or remains of any of the five persons on board has been located. This site is therefore compiled to assist interested persons to share ideas and information regarding this incident. Information on this web page has been carefully researched, and to the best of my knowledge is correct. Photo of Dragon ZK-AXI 'Taniwha' during take-off. 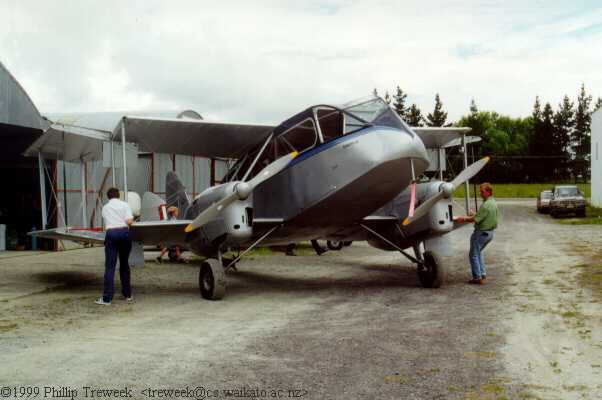 This Dragon is now operated in NZ, and was formerly A34-68. The following information is compiled from my personal notes on the matter, and was sourced from a number of different areas, including RAAF Historical Records Section, RAAF Court of Enquiry into the disappearance of the aircraft, flying logs and similar records, old newspaper clippings, correspondence with other searchers, etc. Notwithstanding, the information provided below is not to be published in either whole or part in any other article without my prior permission. Only minimal information is provided on the crew and passengers aboard the aircraft when it disappeared. This is to preserve the privacy of relatives of the missing airmen. On 19 Jan 43, the RAAF received a DH84 DeHavilland Dragon aircraft, and issued it serial no. A34-47; (it's civil registration was VH-CSN). It was allotted to No. 34 Squadron (SQN) Parafield SA on 23 Feb 43 as a light transport aircraft. The Dragon was a wood and fabric two-bay biplane with folding wings. The engines were two 97kw (130hp) de Havilland Gipsy Major's, and normal accommodation was for a Pilot and six passengers. Eighty-seven of these aircraft were build in Australia. Wingspan was 14.3 metres (m), and length was 10.52 m. Cruising speed was 175 kmph, and its range was 740 km. On 10 Mar 43, the A34-47 was test flown at Parafield. The following day, it commenced the first of many trips from Parafield to Central Australia and return. Following a months reliable service with approx 240 hrs flying time, it was despatched on 14 Apr 43 to Essendon VIC on loan for Melbourne-Sydney transport. The Court of Enquiry into the disappearance of the A34-47 and its five occupants states that A34-47 departed Parafield SA on 14 Apr 43 enroute to Essendon VIC. The aircraft was to collect freight and return to Parafield. However, after its arrival at Essendon, a discussion between the Air Transport Control Office at Essendon and the Commanding Officer (CO) 34 SQN resulted in the aircraft being assigned to convey some special freight from Essendon to Mascot NSW. Three trips were detailed, with the first being scheduled to commence on 15 Apr 43. At 0702 hrs 15 Apr 43, A34-47 commenced its journey from Essendon to Mascot carrying 617 lbs (274 kg) of radio equipment as freight. The Pilot SGT Douglas Brian Doyle 412236 (24 years), and his co-Pilot SGT Francis (Frank) Doyle 420615 (19 years - no relation) did not arrive at Mascot until the following day, having stayed enroute at an unknown location, (most likely RAAF Base Forest Hill, Wagga Wagga NSW - Wagga was Frank's home town). Frank Doyle was assigned as co-Pilot to enable him to acquire as much flying experience as possible in this type of aircraft. At the time, Pilot SGT Doug Doyle had acquired considerable flying experience, having accrued over 331 hrs flying time, (over 100 hrs on the Dragon type aircraft). Although Frank had acquired 212 hrs flying time, he had only acquired approx 8 hrs flying experience on Dragon aircraft. 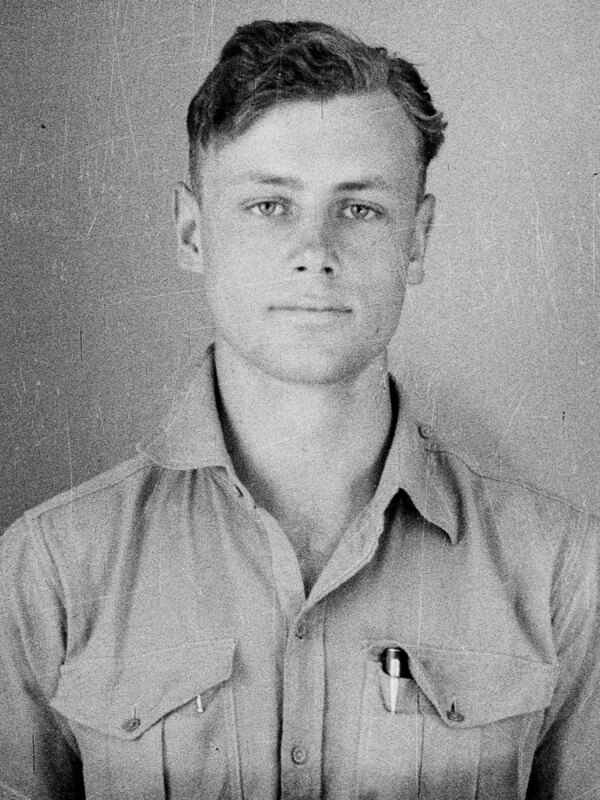 Note: This photo is provided with the kind permission of National Archives of Australia. It is not to be copied or reproduced from this site. Close-up of front of a Dragon, showing manner in which wings can be folded back for storage. Shortly after arrival at Mascot on morning of Fri 16 Apr 43, Pilot Doug Doyle submitted the aircraft to No. 3 Communication Flight for servicing of the magnetos of both engines, the control wires and the airscrews. He also requested that the clock be set and wound. The servicing was reported to have been completed by Flightline aircraft mechanics, although the applicable aircraft servicing sheet, Form E/E77 was not completed. The Pilot was understandably keen to have his aircraft serviced correctly, as he had logged five separate instances of engine vibration during the flight up from Melbourne. It is interesting to note that engine vibration was a common fault in these aircraft at the time, which although later rectified, resulted in a considerable number of crashes/crash landings of other Dragon aircraft. Engine bolts would front at the centre and then shear off, resulting in an immediate engine stoppage. The aircraft would quickly lose altitude, being unable to maintain height on only one engine. About 7.30 am Sat 17 Apr 43, A34-47 Pilot SGT Doug Doyle approached Forecasting Officer Flight Lieutenant (FLTLT) George Rutherford at No. 3 Communication Flight Mascot NSW, and requested provision of a weather forecast for his journey to Essendon via RAAF Base Forest Hill. The FLTLT advised that no unfavourable weather conditions were expected, and accordingly permitted any approved flight path to be taken. He recommended to SGT Doyle that the Goulburn route was the best route to be followed. SGT Doyle was stated to have agreed, and therefore the FLTLT believed at that time that the SGT would follow this route; (there were a number of different routes that the Pilot could follow, the Goulburn route being only one of several). 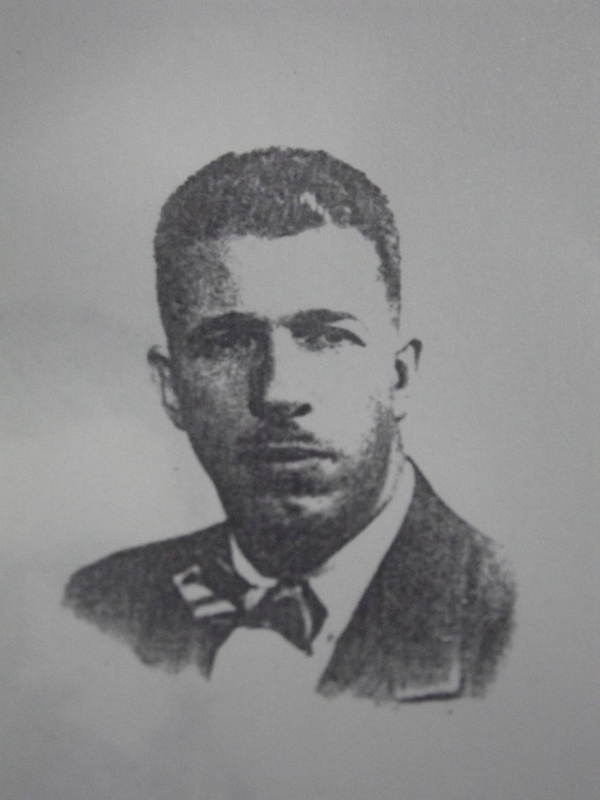 LT Horace Albert Teague 014229 (32 years), also of USMCR. No cargo was specified for conveyance, although an eye-witness on the flightline at Mascot has stated that a large metal box was placed on board A34-47 prior to its departure from Mascot. This is also supported by other snippets of 'circumstantial information', although it has been the subject of fierce debate amongst many searchers over the years. Note: The above photo is provided with the kind permission of National Archives of Australia. It is not to be copied or reproduced from this site. The below photo of LT Cecil Umstead was provided with permission of Piers Bramham and Harry B. Powell. It is not to be copied or reproduced from this site. Note: The above photo of LT Horace Teague is provided with the kind permission of Department of the Navy - Headquarters United States Marine Corps, Washington D.C. It is not to be copied or reproduced from this site. Looking rearwards from the cockpit of a Dragon. Shortly before 10.00 am on 17 Apr 43, Pilot SGT Doug Doyle, co-Pilot SGT Frank Doyle and their three passengers departed Mascot airport in A34-47, enroute to Forest Hill, NSW. The flight was expected to take 2 hrs 40 mins, with arrival at Wagga being anticipated at approx 12.30 hrs same date. The aircraft was to maintain an altitude of 3000 ft. It was sighted shortly after departure to be travelling in the NW lane rather than the SW lane it was expected to fly along. Whilst possible the Pilot (most likely Frank to increase his flying hours), was providing his American passengers a 'birds-eye' view of Sydney, this is however an unlikely scenario if timings provided for the two occasions the aircraft was spotted in the Sydney basin are to be accepted as correct. The last positive sighting of the aircraft was made at 10.07 am by an observer at No. 18 Searchlight Battery, Chester Hills NSW. The aircraft was sighted proceeding about 2000 fit height in a westerly direction, approx 2 miles (3.2 km) south of Prospect Reservoir, NSW. The spotter continued to observe the aircraft until it flew out of sight; (it is interesting to note that many searchers believe this to be the last 'official' sighting of A34-47). 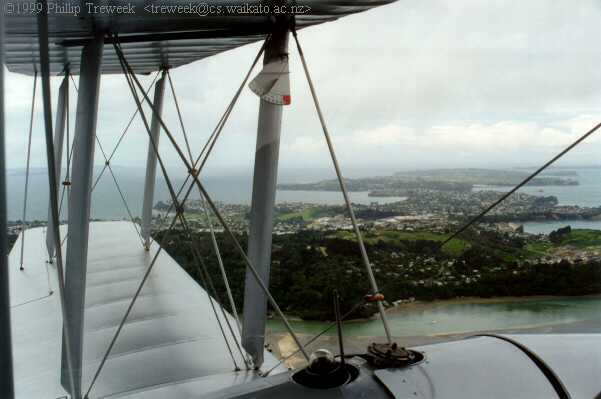 The last probable sighting of this aircraft was made by a Volunteer Air Observer Corps (VAOC) spotter Catherine Adams, at Werombi (NSW). She stated in the Court of Inquiry that she observed an aircraft (fitting the description of the Dragon), flying approx 1.5 miles (2.4 km) SE of Werombi, and heading in a southerly direction. At 1.55 pm 17 Apr 43, the A34-47 and occupants were reported overdue by the Aerodrome Control Officer at Forest Hill. No attempt was made to search for the aircraft until 11.00 am the following day. A message later released by the RAAF provided that the aircraft was 'last seen vicinity Goulburn'. Police and other authorities were notified of the missing aircraft, and accordinly advised that information was being sought as to its whereabouts. It is interesting to note that although the weather was fine on departure, it was reported to be raining over southern NSW by later that afternoon. The following several days saw heavy rain and strong winds between Sydney and Wagga. Enquiries were initiated with other RAAF establishments as to the whereabouts of the missing aircraft. Flight logs at No.1 Fighter Sector were examined, and when plotted, the aircraft was initially ascertained as having proceeded to a point approx 48 miles (77 km) from Cootamundra NSW. Unfortunately however, at 2300 hrs 18 Apr 43 this plot was established to be the result of an error caused by a VAOC spotter who apparently mistakenly had referred to the applicable flight log for 16 Apr 43 instead of 17 Apr 43. This of course led staff to believe A34-47 to be an Avro Anson aircraft which had passed through that area on 16 Apr 43. On 19, 20 and 21 Apr 43, a number of Anson aircraft from 73 SQN (Camden) and No. 3 Communication Flight (Mascot) conducted an intense aerial search of localities between Camden and Goulburn, including the Burragorang Valley and surrounding areas. They searches were unfortunately hampered by poor weather conditions (ie., storms and strong winds), and were abandoned following the last search on 21 Apr 43. View from cabin of a Dragon in flight. Note the fuel glass, fuel filler and airspeed indicator, (160kmph). Despite not knowing exactly which route A34-47 had flown, the RAAF notified applicable authorities (ie., Police) in relevant areas along a number of suspected flight paths, obviously hoping that they may have received reports from 'eyewitnesses' etc, who may have seen an aircraft in difficulties on 17 Apr 43, (or who may have been witness to other unusual sightings which might further their enquiries). On 27 Apr 43 (ten days after the disappearance of A34-47), Mrs Hilda Donahue reported to an enquiring Police Constable that she had heard an aircraft in difficulty near a residence in the Central Burragorang Valley where she was minding a baby; (residence now covered by the waters of Lake Burragorang). Mrs Donahue further reported that shortly after hearing the aircraft, she heard a noise resembling a crash over a mountain on the eastern side of the valley, (Mt Wanganderry, Nattai). She then looked to out of a bedroom window of the residence to see a dust cloud rise up over the mountain. It should be noted that 1.00 pm 17 Apr 43 could not possibly be a correct time of sighting of the A34-47, which would have passed her residence approx 1035 hrs. Despite many theories having been raised over the years which have attempted to explain/support this quite significant time lapse (ie., daylight saving which finished 28 Mar 43! ), it is much more likely that Mrs Donahue either accidently mistook the time of sighting (due to ten days passing from time of incident), or that she saw a search plane on one of the preceeding days ie., 19 Apr 43. The 'crash' and subsequent dust cloud she reported (as being on the eastern side of the valley), could well have come from blasting operations from nearby mining operations on/near the Wanganderry tableland. Alternately, the dust could also have been smoke from wood fires. The majority of searches conducted for this aircraft since 1943 hinge on Mrs Donahue's testimony. I personally believe she saw a low flying search aircraft. The above is said with certainly no disrespect to Mrs Donahue, for whom I have been advised by people who knew her to be a very sincere, decent and reliable person. But I do believe her testimony, despite the best of intentions, to be incorrect. On the basis of information provided by Mrs Donahue, a ground search was initiated. It was led by local farmers Mr Ron Hinds and Mr Laurie Carlon, who were familiar with the proposed search areas, and also comprised a Doctor, amongst other persons. The official party accessed the top of the Wanganderry tableland via a dangerous climb along a narrow ledge on the western face; (this route no longer exists due to rock falls). For reasons unknown, the official search party did not end up searching the most likely areas believed to be where the wrecage of the aircraft might be found. A spotter plane operated in conjunction with the search party on the ground, however the search still proved fruitless, and was discontinued. It is interesting to note that this search was the only 'official' ground search conducted by the RAAF at that time. Many people still believe that the wreckage of the A34-47 is now covered by the waters of Lake Burragorang. It should be noted however that this is highly unlikely, as most areas flooded by Lake Burragorang were cleared, and therefore wreckage of the aircraft would almost certainly have been sighted on cleared lands prior to flooding of Warragamba Dam in 1960. Has anything from the A34-47 ever been found? No - nothing has been found that could be confirmed as having come from the missing aircraft. Many locals were reported to have gone searching for the A34-47 in a non-official capacity. Some of these searches produced items that were initially thought to be from the missing aircraft, but were soon proven not to be the case. Accordingly, a machine gun turret and a machine gun were found in Burragorang wilderness (in the wider vicinity of the Wombeyan Caves), but were later established to have falled from a Hudson, (and another aircraft). A small piece of 'polished plywood' was found downstream from Whitegum Creek, (intersects Nattai River, approx GR605183 on 1:25 000 Nattai 8929-I-S topographic map). 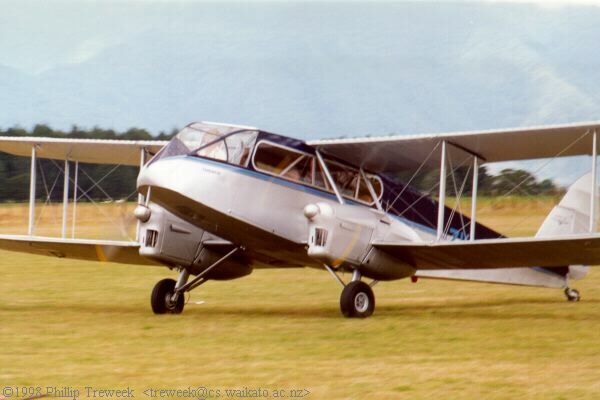 As DH84 Dragon aircraft were fitted with varnished plywood on interior cabin areas, this find led to a considerable amount of search activity by both the RAAF and independent searchers in the late 1970's & early 1980's, and 1987. The find was later followed up by two searchers, and now appears to have been a 'furphy'. A small piece of wooded propellor was also reported to have been found in an unknown location in the valley, although the identity of the finder or location of the propellor does not appear to have been established. There have been other 'finds' made by searchers over the years, most of which I am not really at liberty to report on this page. Unfortunately, none of these finds has yet been positively linked to the missing aircraft, with most being established as either not from the aircraft, or as simply being 'common' items used by military, woodcutters, etc during that period. Notwithstanding the extremely rough terrain that the aircraft is believed to have gone missing in, the difficulty in locating wreckage has not been made any easier by the passage of time (74 years), and therefore would now be extremely difficult to detect. Further to any damage incurred during impact (ie., wreckage of aircraft being broken up and spread about) - fires, falling trees, weathering, shifting soils, rockfalls and vegetative overgrowth will no doubt have assisted to conceal any items which remain above ground. Accordingly, even from close proximity, any wreckage from this aircraft would not be visible in any recognisable form (due to burning, melting, rusting etc), and if visible would more likely resemble that from an old car/truck. Melted alloy engine casings, rusted fragments of twisted metal (from engine covers), awheel inserts, metal struts and rusted cables, would be all that is left from which to identify this aircraft. If a large box was loaded onto the aircraft, it might also be found half-buried. (Some personal effects might also be found). Items shown in photos on this web site are a good guide as to what items might be located during a search ie., airspeed indicator. There have been many people who have searched for this aircraft over the years since 1943. To date, I am aware of at least four main search groups who undertake consistent on-going search activities for wreckage of the A34-47. In particular, there are two individuals I have met whose efforts have been outstanding; both having conducted quite a considerable number of searches for the missing aircraft (one operated from the 1970's to the 1990's). My contribution is far smaller, although I have now organised over a dozen searches (eight in Nattai/Burragorang), and am hoping to continue further activities in the near future. Site first compiled 2003; this update 11 Jan 19. Am keen to maintain/establish further contact with other searchers and any persons interested in locating wreckage of this missing aircraft.